We are specialized in Eagle gate opener systems and their repairs. In addition, are gate intercom repair experts and everyone on our team is familiar with all products made by this brand. Trust our elite company if interested in new gate opener installation or want information regarding the latest phone entry systems. Our staff is knowledgeable and ready to assist customers any time. Such innovative, high tech systems have great importance to everyone's life and that's why a dedicated team is fully prepared to address and support all your needs. We provide excellent gate opener and intercom installation alongside maintenance and emergency repairs. If you are also searching for custom-made gates in Studio City, look no further. You can now have, as any of our previous clients, excellent "accessories" to enclose your property, which will be installed professionally and impress you with their durability. 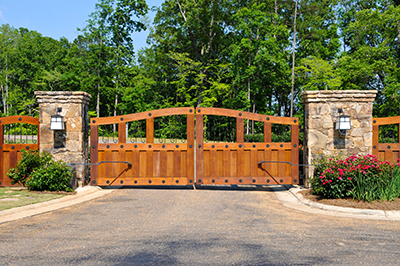 We provide, besides assistance with design, custom gate installation, security, and also maintenance and repair services. Regardless of the mechanism or brand you previously invested in, our technicians have the skills, knowledge and tools to cope with issues that arise. For gate repair, contact us and let us know what the problem is about. The fact that we are seen as a complete gate service company is partly due to our ability to get involved in any gate-related intervention or process, even if we have to take it from stage zero. Thus, if you have in mind a custom gate to order, then you are welcome to inform us about your choice or plan. We will then contact our partners in order to gather all pieces and materials needed to work it out. Have you been charmed by the antique beauty of wrought iron gates? We have contractors to work with, who can create not only the fancy gates, but also custom fences to go with these, for a perfect match. Thus, you can make sure that you will have everything taken care of, by professionals. In case your driveway gate is broken and needs replacement, we do not force you to accept one of the pre-made designs. That could end up looking totally mismatched and would damage the image of your property. Our aim is to please every client with our custom gate repair or installation service, by delivering something not only functional and long lasting, but also in tune with the existing facilities. When you call us for adjustments and repairs, we will not bring you parts made of poor quality materials like plastic. Metal is what we prefer, and we master it well. So far there was not much said about more delicate processes like programming security devices or the electronic gate parts. Good news here as well, as our company covers those, too. If you are not satisfied with your current gate opener or it got broken, call us without hesitation. Our clients have told us they are interested in both aspects when it comes to gates and fences: they want to be safe and to always rely on a functioning mechanism, and they also want a beautiful design to compliment their home. Both these targets are to be reached when you have found your licensed contractor for custom-made gates Studio City. It is best to have it all done at once by a single company, then to opt for "patches" – a piece from here, a piece from there, which leaves room for error and mismatch.